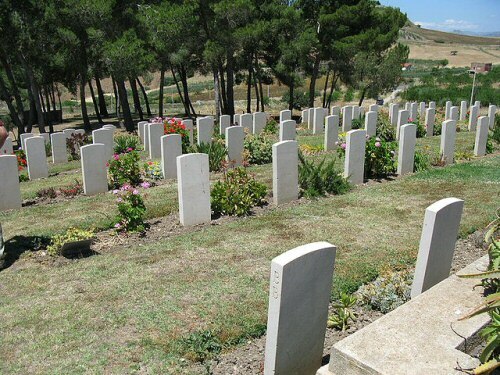 The Agira Canadian War Cemetery is a cemetery in Sicily containing the graves of the Canadians killed during the Sicily campaign of the Second World War. Agira Canadian War Cemetery lies in the Commune of Agira, Province of Enna, in the centre of Sicily. From the autostrada A19, Catania-Palermo, take the exit to Catenanuova. Follow signposts to Regalbuto, then pass Regalbuto, going in the direction of Agira. The Cemetery is then signposted about 12 kilometres from Regalbuto.